The Faculty Lounge: What (If Anything) Do We Owe Future Generations? What (If Anything) Do We Owe Future Generations? As I'm beginning to emerge from (or at least can see the possibility of emerging from) a semester of lots and lots of teaching and service, I'm starting to accumulate a list of things I want and need to read. There's a big stack of antebellum literary addresses, which I love. And then there's the recent scholarship I need to catch up on, like the symposium that the GW Law Review ran last fall on What Does Our Legal System Owe Future Generations. This is a mighty interesting topic--sort of the early twenty-first century version of "should trees have standing," which, btw, will be out in a third edition in the spring. I haven't seen a lot of blogosphere discussion of this symposium, though that may just be because I've been hunkered down this semester. One way of approaching this, I think, is historically--did previous generations think (and act like) their legal system owed us something? Previous generations have done a heck of a lot for us, no doubt. And they did so in part, perhaps large part, because they were building something better for the future. One of my favorite quotes along these lines is Ralph Waldo Emerson's observation in "The American Scholar" that insects store up for future generations. He found the common elements of the human mind to store up knowledge "like the fact observed in insects, who lay up food before death for the young grub they shall never see." There's a great tradition in America--and in human society more generally, I suppose, though I don't have the expertise to testify to it--of making sacrifices for future generations, of doing something so that people whose names we will never know can have a better life. One thinks, of course, of the American Revolution here -- and of course the Puritans' Errand into the Wilderness. Perhaps tragically, though unsurprisingly, there's also a very long lineage to the tradition of getting as much as one can at the present and letting future generations fend for themselves. In fact, I'd say that tradition has a much more robust lineage than the one of the sense that we owe duties to future generations. And, returning to the idea that there are duties owed to future generations, whether those were seen as legally enforceable duties is a separate matter. Moreover, how those principles might have operated in legislatures and courts is something worth some mental elbow grease. I suppose one place to think about this in private law is in the law of trusts, where we are self-consciously looking to preserve something for future beneficiaries. But even there, the inquiry is defined by the settlor's intent. As I say, I'm looking forward to thinking through these papers in some detail as I take a break from plowing through stacks and stacks of exams. 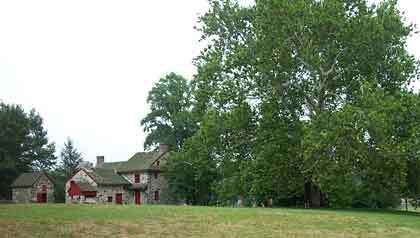 The image is of a Sycamore tree at the Brandywine Battlefield Park, next to the house where LaFayette stayed at the time of the battle. The tree was a lot smaller then, though apparently it was already at that point over 100 years old. How's that for an image for talk of the debts past generations incurred on our behalf? I'll get a nice picture of that when I'm home over winter break, I hope. Also, as long as I'm making promises about pictures I'll take when I'm in Philly, I want to get a picture of the Civil War monument in the park near where I grew up -- it is, of course, of a United States soldier, which is a switch from the photos I've been taking of late of Confederate monuments. Citizens, courts, and legislators of our current generation need to consider the future generations as stakeholders among the usual constituencies as we continue the evolutionary shaping of our doctrines and system of land transactions. While electoral politics and public choice theory (affecting legislators and elected judges) may tell us that it will be difficult to provide a seat at the table for the future generations,10 it is our obligation as citizens and parents to do so. As citizens, we continue to be participants in the great American experiment of building a new and better society, and we need to allow the opportunity for future generations to continue in that quest as well. As parents, we are devoted to the raising of our children and grandchildren. We seek to build a better world for them to inherit, a wish that entails our making decisions today that will affect the future that our children will occupy. At times conflicting with this benign paternalistic activity is our desire to empower our children and to make them autonomous adults able to find fulfillment and happiness through their own efforts. On this subject I always have the overwhelming urge to ask, "Future generations? What did they ever do for us?" More seriously, though, there is a fairly larger philosophical literature on the subject, mostly under the heading "justice between generations". The "modern" discussion of the issue in philosophy goes at least back to Rawls, who has several discussions on the issue, partly related to his idea of a "just savings principle", in _A Theory of Justice_. (The idea is also discussed, to some degree, by Mill, in particular in his idea of a "stationary state economy" and by Sidgwick, though less directly, I think. It's possible that other philosophers spent time on the idea between Sidgwick and Rawls but I'm not sure.) How easily this philosophical discussion can be translated into useful legal or political principles is, of course, unclear.